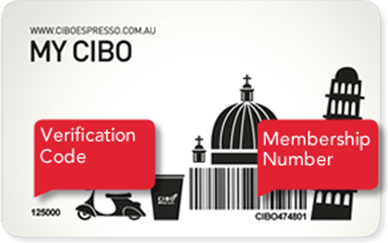 Join My CIBO to get special offers and collect loyalty points which can be used to redeem a free coffee. Points can only be redeemed once your card is activated online. Your card must be registered before money on your card can be spent. In store or takeaway, every time you purchase a coffee or tea at any CIBO Espresso you earn points with the My CIBO loyalty program. Points are collected based on your spend of coffee and tea products purchased throughout CIBO Espresso stores in SA & Newcastle. You will even earn points when you choose to have soy milk, grande or alto sized coffee. Our Loyalty Card also allows you to load money onto it, which can be spent on any product in store, and is perfect for those days you don’t want to carry around a wallet! Money can be loaded onto your My CIBO card (in store) and spent on any products. PASSWORD – will be used to log into your account and check your points balance. Q: What can I earn points on? A: You can earn points on everything on the Caffe Menu – which includes: coffee, tea, hot chocolate, chai, gelati shakes, gelati smoothies, affogatos. Q: What can I redeem points on? A: You can redeem points on the same products that you earn points on. Q: How many points do I earn for every dollar I spend? A: First, you will need to make sure that you are entering the Membership number (CIB****** – found underneath the barcode) and the Verification code (bottom left hand corner) correctly. If you have registered a card before, you can not enter another card to same email address. If you still have problems registering your card, please email us at cibo@ciboespresso.com.au. A: You will need to collect a new card from your closest CIBO Espresso store and log into your My CIBO account, using your email and password connected to your old card. Then go to the ‘Card Transfer’ section, where you will enter the new Membership Number and Verification code on the card. All existing points and information will transfer on to the new card. Q: Is there a limit on points and do they expire? A: You can collect as many points as you want and points have no expiry date. Q: My card is not scanning properly, what should I do? A: We recommend you collect a new card. First you will need to collect a new card from your closest CIBO Espresso store. You will then need to log into your My CIBO account, using your email and password connected to your old card. Then go to the ‘Card Transfer’ section, where you will enter the new Membership Number and Verification code on the card. All existing points and information will transfer on to the new card. Q: What is the cash function? A: This allows you to load money on to your My CIBO card and treat it like a CIBO Credit Card. This money can be spent on any product in store, but points will still only be earned on Caffe menu items. Q: How do I change the details on my card? A: Just log into your My CIBO account, head to the profile section and change your details. Q: How do I know when I have enough points to collect my free drink? A: On your 11th purchase, you are eligible to redeem your free coffee. You can check your points balance by logging in to your My CIBO account, or ask a staff member in store who will be able to check by swiping your card. Q: I still have the old CIBO stamp card, can I transfer these points on to the new card? A: No, you will have to finish off your old stamp card and then you can start using the new loyalty card to start collecting your points. Please note that stamp cards will no longer be accepted after 31 October 2012. This includes CIBO Espresso Adelaide Airport.